Description: Southbound train rushes by Pomona yard with two ex Southern SD40-2's and a GP59. Description: NS L74 has the Maersk unit trailing & some loads for the Lima Tank Plant. 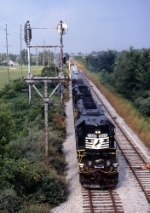 Description: L74 heads toward Lima past turned Nickel Plate signals. 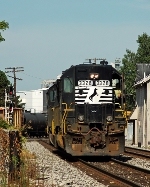 Description: The SD40-2 brings a loaded train of Grain hoppers from a nearby elevator. Description: Norfolk Southerns Fostoria, Oh., local L74 waits at a red signal at the B&O Diamond, as CSX train Q37503 blocks it path to the ADM elevator and needed work there, with NS 3317 & 3328. Description: Norfolk Southern Fostoria local L74, with NS 3328 & 3317, lead 6 cars back to the yard, returning from Mennel Milling. Description: 3328 leads L74 past MP 280 on NS' Fostoria District. Description: the NS local waits to return to Blair yard.